Sussex have it all to do on the final day if they are to avoid a fifth County Championship loss in six matches in their clash with Durham at Arundel. They have been set a club record fourth innings total of 514 for victory, which if they manage to chase will beat the current highest total of 455 they got against Gloucestershire in 2000. Luke Wells reached the close unbeaten on 53, while Ed Joyce is the the other not out batsmen overnight. Sussex closed day three 114-2 meaning they still require 400 on the final day to win or alternatively they need to bat 96 overs to hold out for a draw. After resuming on 168-6, Durham piled on the runs thanks largely to a century from Gordon Muchall. Muchall hit 115 to go with his unbeaten 81 in the first innings to put his side in the ascendency. He was eventually dismissed shortly before lunch as Tim Linley bowled him. The flow of runs did stop there for Durham, though, as John Hastings crashed 91 from just 72 balls. His innings included nine fours and two sixes and gave his side complete control of the contest. He was the last man to fall as Durham were all out for 413 in 101.4 overs. It was a remarkable third innings score when you think that yesterday they found themselves 13-4. 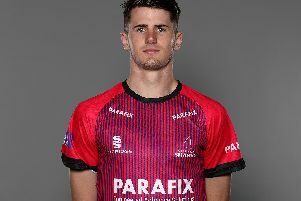 Steve Magoffin ended with figures of 5-89, while Linley added three wickets to his five wicket haul in the first innings to take his match total to eight. Sussex, who were set a club record fourth innings target of 514 to win, started well with Yardy and Wells seeing out the final 11 overs before tea without a wicket falling. Paul Coughlin removed Yardy for 28 with just his fourth ball of the after he was caught behind. Matt Machan then fell soon after for 24 after nicking one behind to Michael Richardson of the bowling of Hastings. Wells batted very well for his half-century, while Joyce saw out the day but it will take a huge effort if Sussex are to come away from the game with a result tomorrow.